An Afghanistan government assessment of its own police force raises concern that unresolved issues are undermining the ability to take over security in the country, according to a report obtained by Security Clearance. The report by the Afghan Interior Ministry looks at five major threats facing the Afghan National Police. They range across the spectrum of long-time problems inside Afghanistan and include outside terrorist threats and armed opposition to the Afghan government, unlawful governance and corruption, illegal drug trade, organized crime and illegally armed groups. Resolving the threats is critical not just for the police force but also for overall stability as the country seeks to take over security from U.S. and NATO forces by the end of 2014. The threats, narrowed down from "a list of numerous others," according to NATO officials, are identified in the Afghan National Police Strategy report obtained by Security Clearance. The report, published this month, was prepared by the Afghan Minister of the Interior Gen. Bissmillah Mohammadi and outlines his strategic priorities for the police force over the next half-decade. The report says the five threats will have, "a considerable negative impact on the resources and capabilities of the Afghan National Security Force," as a whole. If the police are unable to overcome the threats it would force the Afghan Army to continue filling the gaps left by the police and not able to the conduct their usual duties, according to NATO officials familiar with Afghan Security Force training. "There has been a significant change in the nature of the threats to the internal security of Afghanistan over the last years," according to the report. "This change has caused the balance of police missions to change and has added significantly to the daily security force requirements," according to the report. Consistently fighting image problems of serious corruption, readiness and brutality among local populations, the Afghan National Police are considered by NATO officials to be well behind the preparedness level of the Afghan Army, but slowly progressing despite training issues. The Afghan National Police are charged with protecting internal security for the country, providing security for religious, political and social activities as well as protection from criminals and illegal activities. The Afghan Army, which has a different mission, still provides a good deal of security to cover the police gaps around the country. At the NATO summit in Chicago earlier this month, officials announced the Afghan Security Force would remain at a maximum level of more than 350,000 through the end of 2015 and then begin to draw down as security threats reduce. About 157,000 of those would be Afghan National Police, according to the Police Strategy. But privately, NATO officials say the number could stay at 350,000 or a slightly reduced number past the 2015 timeline if the Afghan police do not show any progress and fail to bring or keep their patrol regions under control. That higher number could also have a financial effect on the security forces, because the cost to maintain the 350,000 level is $4.2 billion per year. Keeping forces at higher levels for longer could be problematic if NATO allies and partners, already financially stretched, do not provide the money for a longer period of higher security force levels. But as parts of Afghanistan transition from NATO to Afghan control, Gen. John Allen, the top commander of NATO forces in Afghanistan, says the police are surprising them. "In the areas where transition is under way now, we have not seen a dramatic uptick in violence, and what we have seen is that the Afghan security forces, both army and police, have actually surprised us a bit, and maybe surprised themselves a bit by their ability to handle this," Allen told reporters at the NATO summit last week in Chicago. While most of those areas were already secure with little or no threats, Allen said the next six months as the 23,000 U.S. surge troops depart, "will be telling," he said. Afghan security forces have taken control of 75% of the areas where the bulk of the population lives, NATO announced this month. But most of those regions are uncontested by the Taliban or other anti-government forces. According to the report, Afghan National Police forces are operating in 34 provinces around the country, 16 of which are considered low-threat, six have some terrorist activity that can be sometimes handled by the police and 12 provinces are considered to have high terrorist activity where daily combat activity occurs. But the report does not examine how the Afghan National Police are performing in any of the districts. It also says there are eight districts where actual government control is in question, but offers no other detail on that statistic. The police strategy also highlighted other police deficiencies, including behaving in a militaristic manner and intimidating the local population as well as corruption inside the force, which the report says, "never goes unnoticed by the public." The report also highlights the threat of major security gaps and the threat of the country facing internal security problems if NATO trainers leave before the police are properly trained, equipped and educated. 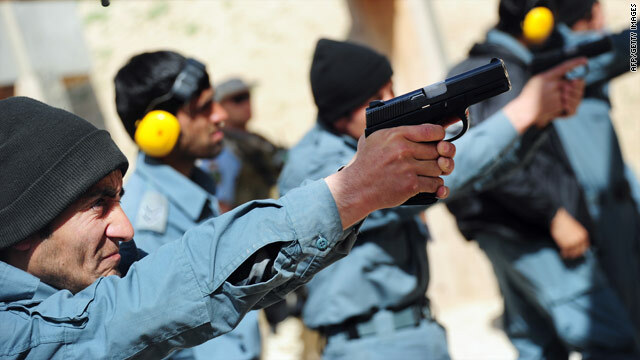 While the report does not give an assessment on how the Afghan National Police are doing in training and in the field, it does give some insight into areas that the organization is working to improve, including corruption, education, leadership development and improving living and working standards for the force. When asked what success looks like in Afghanistan, Chairman of the Joint Chiefs of Staff Gen. Martin Dempsey said on Monday, "Success in Afghanistan will be when the Afghan Security Forces are capable of maintaining stability inside of their own country and that the central government of Afghanistan is able to provide governance. That's always been the definition of success." Groups like the Taliban, Haqqani network and the Hikmatyar group have long posed the biggest threats inside Afghanistan as they operate in the shadowy borderlands in Pakistan along the Afghan border, slipping weapons and fighters between the porous border and attacking U.S. and Afghan forces. "The key to this threat has been the sanctuaries of the terrorists across the borders from Afghanistan and their ability to recruit, train, equip, finance and organize cross-border operations," according to the report. "They are adapting their techniques and procedures for the specific areas within which they operate, and their technology is equal to the defending forces," it continues. Another long-standing problem since the United States ousted the Taliban in 2001 is political corruption, which runs through local government to the very high levels of the Afghan government. There is also rampant corruption within the security forces, according to numerous U.S officials. Both types of corruption have earned distrust among the Afghan population, making it more difficult for the police and other security forces to do their job, according to NATO officials. According to one U.S. commander, "The threat of corruption is very real," said Maj. Gen. John Toolan, who just returned from commanding NATO forces in southwest Afghanistan. "If we want to lose everything we have gained, if we allow corruption to take root, it will all come crashing in," he told reporters last month upon his return. "Afghanistan is the No. 1 narcotics-producing country in the world," according to the report. "A significant part of the financial resources of the terrorists comes from the production and trafficking of narcotics as well as extortion of people," the report continues. Toolan, who commanded in one of the prime narcotic-growing areas of Afghanistan, saw the drug problem firsthand. "We are making progress, but it's nascent," Toolan said of drug activities in his area. "It's really only in the past year that the narcotics interdiction units and the government of Afghanistan have been effective," he said. While the police report does not detail exactly what the organized crime threat is, NATO documents show a diversion of $10 million a day from Afghanistan's airport operations, borders and customs depots. The criminal element is stealing money from the country, according to NATO documents. Most of that money then leaves Afghanistan and bleeds the country of resources for the government. Smaller than the main terrorist groups, illegally armed groups do not generally have a goal of overthrowing the government of Afghanistan as their end state but are strictly looking for financial reward, according to NATO officials. These groups tend to be focused in narco-trafficking and any other criminal pursuit that will bring in cash, but they can also join terrorist networks when it is financially advantageous. Corruption starts from the gov. It seems the talibans has more advanced technology than the afghan armed forces and police. I think nato,and or usa should still hang out in afghan for a little bit. Less all the work will be useless when taliban says "ahamdululai"
I am afraid that when NATO leaves the Afgans will immediately lay down their arms when the Taliban say boo. The western nations just can't realize the ruthfulllness of the Islamist. They are people who will blow themselves up for their fanatical beliefs. How barbaric of these people. American cops would never shoot at foreign invaders.